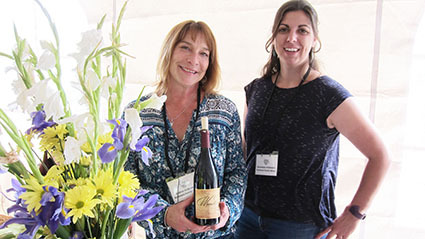 The third weekend in May we headed north for our first visit to the Anderson Valley Pinot Noir Festival. We had reservations at The Madrones, right next door to the event. More on this unusual and fun place to stay later. First, we wanted to give our overall impression of Anderson Valley pinots. We’re late getting this onto the blog. We have both had very busy summers, including paying customers. But now we’re back to the important stuff. In an effort to expedite posting, this will be the first of three or four reviews of this event. Never fear, we have plenty to say. The valley is part of the main route from US highway 101 to Mendocino and the north coast. It is ideal for pinot noir and chardonnay with mountains, proximity to the ocean, and a northern latitude (39 degrees to be precise). Anderson Valley pinots tend to be somewhat lighter than most, probably due to the shorter, cooler growing season. We highly recommend this event. It’s not just a Saturday afternoon grand tasting (although that was pretty nice despite the rain). 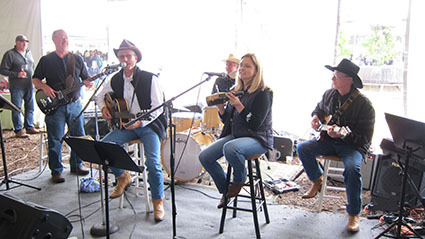 This is a long weekend event with wineries offering special tastings and food on Sunday. We planned carefully and recommend that you do likewise. 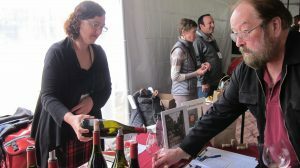 Reserve the Saturday event for wineries that don’t have tasting rooms or that are located outside the Anderson Valley. (The requirement for inclusion is a wine made from Anderson Valley grapes, not a physical presence in the region.) Spend Sunday exploring the local wineries. We promise this will be a delightful experience. If you’re of a certain age you’ll remember the Napa Valley in the 1970s and Sonoma in the 1980s. These wineries are generally informal, interesting, and owned by true individuals with unique personalities and winemaking philosophies. We’ll have a few recommendations in part 2 of this review. The venue was the Goldeneye Winery, conveniently located right next to our room at The Madrones. (The Indian Creek Inn is also very close, but we haven’t stayed there, so we won’t comment one way or the other.) Goldeneye is a project of the legendary Duckhorn family. Goleneye is devoted to Anderson Valley pinot. We’ll review them in part three of this article. The actual event was behind the winery in a tent that was a square tunnel. This would have allowed circulation across the center – but it was raining, sometimes heavily. Nevertheless, we persisted, wading through the crowds. We’ll discuss the wineries in roughly the order of our preferences. The usual disclaimers apply. We write about what we like. Tasting at an event is not the same as tasting in a more relaxed environment. And please remember we’re not getting paid for this. It’s a labor of love. The 2013 Jolie opens with aromas of black raspberry and pomegranate. On the palate this wine is light, with smoke, tobacco, and red currants. Another 2013, Stormin’ featured excellent acid balance. Darker and more brooding than the Jolie, the nose features brambleberry and dark coffee. Flavors of chocolate with earthy undertones. The 2012 Hawkster is the usual big fruit bomb. Scents of spice and black cherry are followed by brambleberry and anise. If you don’t like Hawkster you just plain don’t like pinot noir. By a slim margin, Waits-Mast rates as best in show that’s new to us. In a note of serious irony, the winery is headquartered on Minnesota St. … in San Francisco (Dogpatch neighborhood). Brian Mast and Jennifer Waits specialize in single-vineyard pinots. And they do a great job. Waits-Mast Family Cellars started production in 2007. Their 2013 Nash Mill Vineyard ($40, 67 cases produced) features lots of spice and a hint of vanilla on the finish. A very light nose, with elements of red raspberries and cranberries. The Wentzel Vineyard is in the hills above the Goldeneye winery. The 2013 edition ($47, 42 cases) opens with black cherry aromas leading to a spicy palate with good acid balance. Deer Meadows Vineyard is just off Deer Meadows Road (of course). The 2013 ($58, 115 cases) is juicy, loaded with blackberry and black cherry. You will not go wrong with any of these wines. Co-owner Moira Conzelman greeted us with a big smile and incredible enthusiasm. And why not? Their pinots are very, very good. 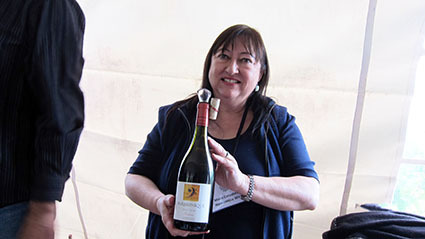 Moira and her husband Bruce started the winery in 2002. In 2007 they bought what is now Conzelman Vineyards. They sell some of the grapes to their winery and the rest to the highest bidder. 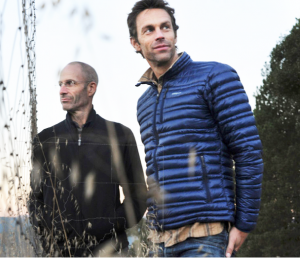 Harmonique follows the increasingly popular virtual winery business model. They use a custom crush facility for their winemaking needs. Apparently that worked as they could afford to buy the vineyard. Their 2009 Elegancé ($48) opens with fruit forward aromas of cherries and red raspberries with a hint of spice. On the palate, the fruit darkens to by blackberry and black cherry. A long finish ends with a touch of mocha. The 2009 “The Noble One” ($39) opens with aromas of tobacco and leather followed by a rich, full mouth feel. Flavors of dark fruit with a hint of molasses on the finish. Grapes were sourced from vineyards in the cooler, “deep end” of Anderson Valley. Two notables are the Klindt Vineyard Pommard and 115 clones, and Conzelman Vineyard Pommard, 115, and 667 clones. The 2009 Delicacé ($46) was our favorite of the three. Featuring a nice body, the wine is a mouth full of chocolate and black cherry with nice mineral balance. These folks currently are in first place for the least pronounceable winery name in California. Tip: don’t try to say it, just enjoy their terrific wine. The Ardzrooni Family farms about 600 acres in the Anderson Valley. They’ve been growing grapes in California since the late 1880s. Around 1990 they moved to Anderson Valley. But their first vintage was 2012. Current production: all of 150 cases per year. Get it while you can. This is truly a family operation. Paul grows the grapes and his daughter Genevieve is the winemaker. In 2009 they planted the Wendling vineyard, 20 acres of various clones of pinot noir. They also farm the Farrington vineyard, giving them sources for terrific grapes. The 2013 “Genevieve’s Blend” ($32, 120 cases) combines grapes from the Farrington and Wendling vineyards. Aromas of black cherry and licorice lead to black cherries and more licorice on the palate. A long, spicy finish makes this our first BARGAIN of the event. 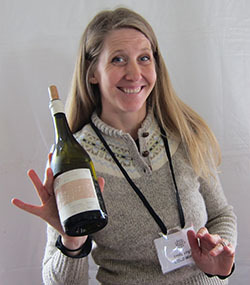 The 2014 Wendling Vineyard (not on web site) features lots of spice with a good balance, “I like that” says Norma. We met in 2001, when Kevin was wine director at Spago-Beverly Hills, and Matt was the national sales director for North Berkeley Imports. The alley behind the restaurant served as a makeshift tasting area and the rain gutter as a spit bucket. Our friendship was immediate and easy, and it didn’t take long for conversations about Burgundy, Piedmont, and Rhone to evolve into ideas about winemaking here at home. OK, these two guys have serious credibility. And they get more kudos for their extensive coverage of their vineyard sources. Emily Virgil was behind the table, pouring tastes and giving background. Here’s what we thought. 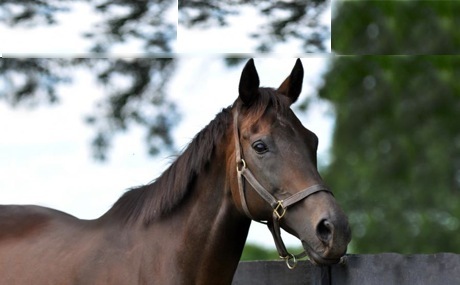 From a selection of premier Anderson Valley sites including Cozelman & Cerise. Pinot Noir clones Pommard, 115, 667 and 777 planted in varied soils of decomposed sandstone, clay, and fractured rock in elevations ranging from 400-1100 feet. Along with an omnipresent marine influence, this valley is defined by the presence of old growth redwood trees. La Selva means ‘the forest’ in Spanish. Aromas of anise, mulberry, dried oregano followed by red currant, and dried strawberry on the palate. Not for the faint of heart! We’ll review wines from Knez in part three of this review. It happens that Knez owns the Cerise vineyard. And LIOCO’s 2013 Cerise Vineyard is a good representation of these grapes. (We also tasted and bought a few bottles of the Knez Winery Cerise. Be patient.) The LIOCO version features bing cherries and strawberries with a good acid balance. This vineyard is above Boonville where it gets more sun than the Klindt Vineyard. Speaking of which, the 2012 Klindt vineyard is the best of the three. Located at the deep end of the valley, this is a tough place to grow anything, much less pinot noir grapes. But the Klindts persisted, helped by Matt and Kevin. More cranberries with bing cherries and some earthy elements on the nose, followed by pickled plum, chinese five spice, and fresh chanterelle palate. Unusual and tasty. But get it while you can. The Klindt vineyard has been sold and their grapes will not be available to LIOCO in the foreseeable future. We’ve reviewed five wineries from the Saturday event. We have at least five more to go; that will be part two. After that, we’ll look at the local wineries we discovered Sunday. By then it will probably be 2017.